If you feel your water consumption is higher than it should be, you should check for leaks. The most common leaks are toilets. Leaking water produces a high water bill without your knowledge. Some leaks are sporadic and require some detective work. Other leaks are very obvious. It doesn't matter what type of leak you have, they both have solutions. 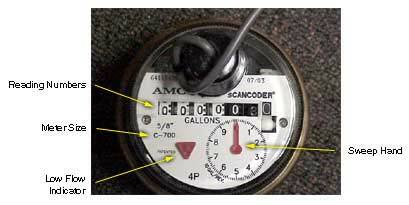 Your water meter can be a valuable tool in detecting leaks. If you don't know the location of your water meter, call the water office to find out the location. You will need a wrench to loosen the bolt on the meter lid. CAREFULLY raise the lid to avoid breaking the wire that connects the meter to the lid. REMEMBER, if you damage this connection, you will be responsible for the cost of the repair. Locate the meter dial. It should look like the photo below. Some meter pits are full of water. This does not mean that you have a leak. It could be natural ground water. You may have to use a pump to remove the water from your meter pit or bail the water out with a small bucket. Make sure all water using fixtures in your home are not in use. Check to see if the triangle on the face of the meter is moving. It is a low flow indicator. If it is, you either have a leak or something in your home is using water. Go find it! Places to look are toilets (flappers get old and wear out) faucets, hot water heaters, water softeners etc. The sweep hand turns a full rotation when 10 gallons of water has gone through the meter. Wait 5-10 minutes after the last flush. Remove tank cover. Is the water level in the tank too high and spilling into the overflow tube? If it is you have a leak. While you have the tank cover off, put food coloring, laundry bluing or a leak detector tablet in the toilet tank. Wait at least 30 minutes. If the colored water appears in the bowl, you have a leak. Wet spots in your yard between the meter vault and your house. A noticeable loss in water pressure or flow throughout your home. Turn off the main shut off valve inside your home and then go outside and check your water meter. If your water meter is turning, you have a leak underground and may have to contact a plumber.